Cubmaster Kevin Meyer, back, poses with Cub Scouts, from left to right, Eli Huwer, Carter Korte, Ben Meyer and Henry Hanson after awarding the Scouts their “Arrow of Light” awards during the Minster Cub Scout Pack 44 meeting on Monday, March 11, at the high school cafeteria. The four Weblos II Cub Scouts participated in a “Crossing Over” ceremony as they completed their Cub Scout program. The “Arrow of Light” award, which is the highest award they can earn, can be displayed on their Boy Scout uniform when they join. 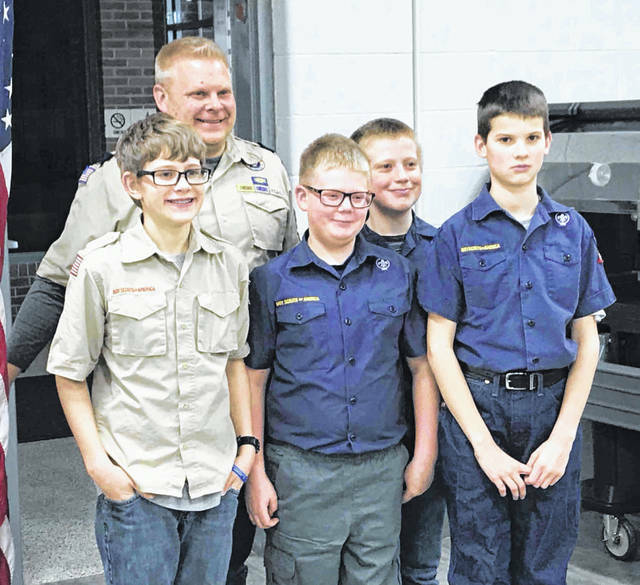 https://www.sidneydailynews.com/wp-content/uploads/sites/47/2019/03/web1_boyscoutstandalone.jpgCubmaster Kevin Meyer, back, poses with Cub Scouts, from left to right, Eli Huwer, Carter Korte, Ben Meyer and Henry Hanson after awarding the Scouts their “Arrow of Light” awards during the Minster Cub Scout Pack 44 meeting on Monday, March 11, at the high school cafeteria. The four Weblos II Cub Scouts participated in a “Crossing Over” ceremony as they completed their Cub Scout program. The “Arrow of Light” award, which is the highest award they can earn, can be displayed on their Boy Scout uniform when they join. Courtesy photo.